Quoted prices are per case (12/750) unless otherwise stated. Opening orders will generally be Cash On Delivery. Thereafter, we are happy to extend the courtesy of 30-Days credit terms to customers in good credit standing whose accounts are current. As a minimum, we will require a properly completed credit application on file. We reserve the right to amend this policy to Cash On Delivery. All sales are final. Items may assort for discounts. Check with your sales representative. Orders are placed within one business day. Please allow one week for delivery in Southern California and two weeks in Northern California unless noted to the contrary herein, or special arrangements have been made at a possible additional cost. 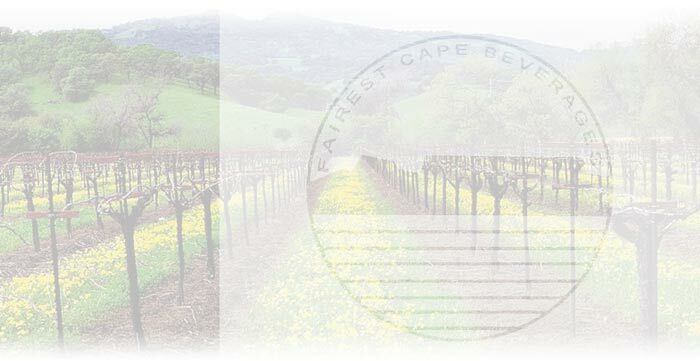 Failure to deliver by a specified date is not grounds for cancellation or amendment of the order, nor does Fairest Cape Beverage Company being out of stock of an item rescind the order for that or any other item ordered concurrently.